A major water treatment plant and additional drinking water storage entered service at Woodglen in 2010, providing a significant boost to East Gippsland’s long-term water security. The facilities formed part of a $67 million program of initiatives designed to ensure East Gippsland Water customers have secure drinking water supplies well into the future. Located northwest of Bairnsdale at Woodglen, they are benefitting some 24,000 people reliant on the Mitchell River water supply system, from Lindenow in the west through to Nowa Nowa, including the communities of Bairnsdale, Paynesville and Lakes Entrance. The latest water storage is 600 metres long, 300 metres wide and ten metres deep. Designed to hold 715 megalitres of water – roughly equivalent to 715 Olympic-size swimming pools – it supplements Woodglen’s original 850 megalitre storage. The water treatment plant is a first for the Mitchell River system and capable of processing up to 20 megalitres of water a day (roughly equivalent to 20 Olympic size swimming pools). It utilises a Dissolved Air Floatation / Filtration process, more commonly known as a DAFF water treatment process. With DAFF, a coagulant is first added to the water to attract dirt and colour particles. These particles stick to air bubbles injected into the water and float to the surface where they are skimmed off as sludge. The cleaner water next passes through a dual filter of sand and anthracite (filter coal) to further remove impurities. Finally, before going into the main supply pipeline to customers, it will be disinfected and fluoride added. In the meantime a centrifuge is used to spin all excess water from the sludge, with this water piped back into the plant to be processed and the remaining sludge residue removed from the site. 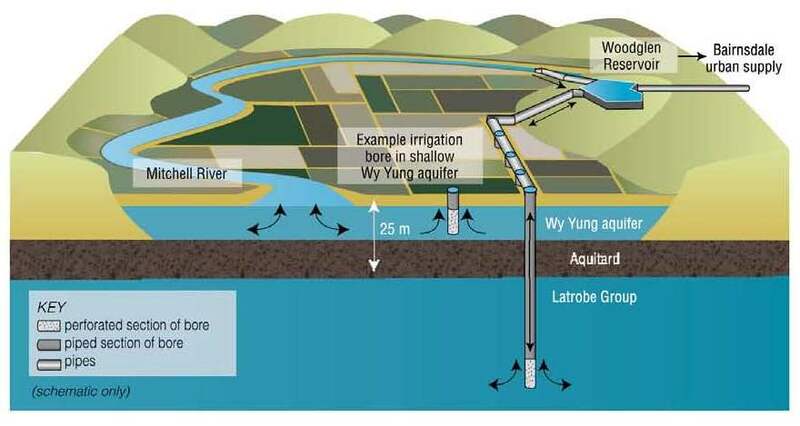 Addressing the need for an additional water storage, East Gippsland Water was granted a licence (from groundwater regulator Southern Rural Water) to use an aquifer as a natural underground storage for drinking water, using a process known as Aquifer Storage and Recovery (ASR). ASR is the process of injecting water – in this case untreated water for drinking purposes – into an underground aquifer for storage and then supply to customers at a later date as required. Using an aquifer reduces the potential for water loss through evaporation and ensures the availability of high quality drinking water, free from risks of algal and airborne contamination. This internationally-proven technology represents a far more cost-effective water storage than traditional infrastructure such as open basins, dams and tanks. East Gippsland Water is utilising the deep Latrobe Group of aquifers at Woodglen, north west of Bairnsdale. Water is drawn from the Mitchell River nearby (only during periods of peak flow). It is pumped into one of the Woodglen water storage basins and gravity-fed into the aquifers. That water stored in the aquifers is available to be extracted at a later date, as needed, and fully treated at the adjacent water treatment plant, before entering the water supply network. What does ASR look like?